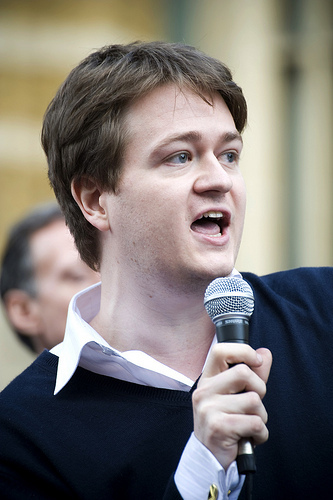 DSG's exposal of liberal journalist Johann Hari's plagiarism, which eventually became a scandal and led to his downfall as a respected journalist. As an amusing aside from our usual ruthless criticism of everything existing, here’s a little insight into the workings of the mainstream media. We’ve long found this piece of super-liberal journalism rather lulzy- it’s an attempted take-down of Italian communist and every ultra-leftist’s favourite “psychopath”, Toni Negri, by Orwell Prize winner Johann Hari from The Independent in 2004. Hari interviews him at the ICA in London, and carefully tries to balance his horror at the Gulag with his horror of Negri’s flagrant disregard of a no smoking sign, heavily implying throughout that Negri is a murderous terror-monger. It was a poor interview, failing to even attempt to engage with his writings on the grounds that it’s too impenetrable, although he paints a vivid picture of Negri as a personally rude and rather objectionable man. A great introduction to this formidable “old terrorist” is the book “Negri on Negri”, published in 2003, where Anne Dufourmentelle produces an in-depth interview, based around a lexicon of his thought, and forming a much more cohesive and thorough look at the man’s ideas and life. But reading through it, a strange sense of deja-vu settled over us. Where have we read that before? This week, it was bought to our attention. It’s rather ironic that an article whose main premise is that Negri negates a “truthful memory”, essentially attempting to fabricate history to fit his own political agenda, seems to be based upon an encounter in the ICA which is almost entirely fabricated. To take Negri’s answers to entirely different questions, and recontextualise them around Hari’s agenda, which involves the sustenance of the very systems of power that falsely accused and imprisoned Negri for decades of his life as a political prisoner in Italy, seems especially disingenuous. Today’s climate seems rife with journalists, politicians and the Police trying to paint those who take action outside of parliamentary power structures as “extremists”, whilst those who pooter on defending an increasingly indefensible status quo pull back the boundaries of what is, and what isn’t, acceptable politics. The parliamentary system of democracy is indicting itself across Europe, and as a reaction, radical thought and direct action is increasingly vilified within “mainstream” discourse. To quote Orwell himself- “Liberal- a power worshipper without power”. Negri is a complex, flawed yet exciting writer, with a fascinating history of conflict with the state, playing an influential role in the radical Italian left in the 20th century. If you want to get to know something about him, do what Hari did- read Dufourmentelle’s book, or some of his own writings.